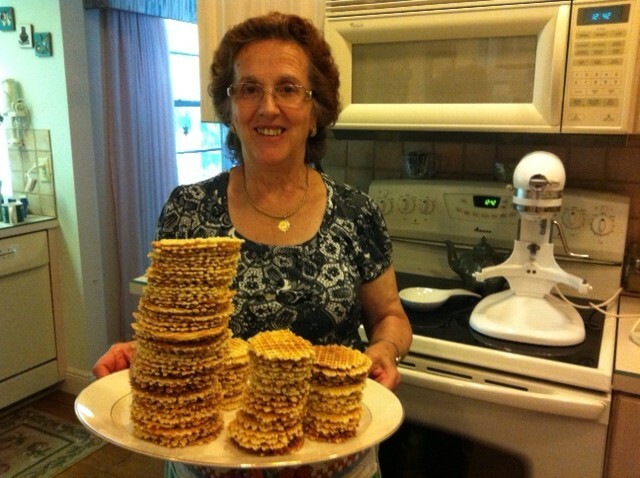 On cookie day with Raffaela, she also arrived prepared to make Pizzelles, another of my favorites. The recipe follows. Mix 12 eggs with electric mixer. Keep the mixer running while adding sugar, rind, Anisette, and oil. Mix baking powder with flour, then add to batter a little at a time. The batter should be the consistency of thick yogurt. It needs to set up on a teaspoon and drop in thick dollops. Pizzelles are baked on a Pizzelle Baker, which is a waffle-baker type appliance. Using a teaspoon, place a small dollop of batter in the center of the baker. It’s better for a cookie to be a bit small than to have the batter ooze outside the imprint. The ones Raffaela brought to my house baked two cookies at a time. One baker made cookies about 4 inches in diameter. The other one made 3-inch cookies.